Philips and Institut Curie (Curie Cancer Carnot Institute) have decided to invest more than 250 000 euros each in a partnership linked to the clinical use of the nuclear medicine PET scan Vereos, the first and only entirely digital PET/CT currently available on the market. Such a system can offer improved spatial resolution, significant gain in sensitivity and a better precision compared to standard analog systems. Philips is honored to associate to Institut Curie (Curie Cancer Carnot Institute) in the framework of a long-lasting partnership whose purpose is to develop clinical research projects aiming at the improvement of cancer diagnostics and patient treatment. 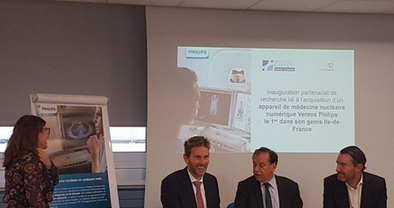 This project follows the acquisition by Institut Curie of a nuclear medicine digital system Philips Vereos, the first of its kind in the Paris region.